The annual Mardi Gras Ball is a night that McNicholas students look forward to all year long. It’s the only McNick event that brings the entire student body together to have fun and to recognize fellow Rockets for their dedication to the school. What many students don’t realize, though, is how much planning goes into making that one night perfect. Once the list of nominees is validated and assembled, faculty members have to approve all the members on the list and have the opportunity to add any student that they feel deserve to be on it. Then the revised list is re-sent to the students and faculty for voting. One of the reasons Mardi Gras is so unique is that the votes are accumulated over all four years. 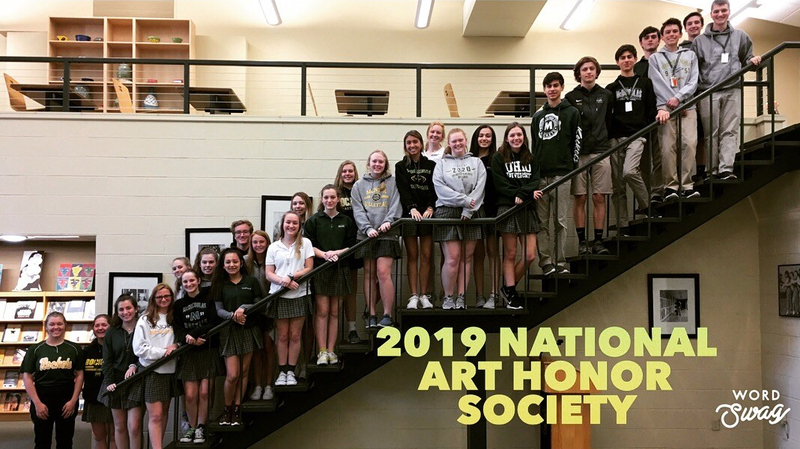 In January, 20 men and 20 women from the senior class are announced for the Court, and 4 men and 4 women from each of the sophomore and junior classes are on the Honor Guard. Once the theme is announced, art students, with the help of art teacher Willy Corbett and Fine Arts Department Chair Mel Gaskins, create all the decorations for the dance. This year, seniors Catherine Adams, Grace Hiltz, Ty Jabin, and Ellen Uhl assisted Gaskins in coordinating the decorations. They constructed dozens of cardboard trees and stalagmites that adorned the lobby. Students also create most of the artwork that is included in the event. This year, Uhl designed the banner, sophomore Maria Ciampone designed the program cover, and junior Sarah Foster did the ticket artwork. Preparing the school for the dance is no easy task. Faculty members start setting up during school on Friday and don’t finish until Saturday night or Sunday morning. Members of the Court also assist in the set up in shifts. The lobby is completely transformed with the decorations that art students have created. In the gym, the tarp is laid down, chairs have to be put out and arranged, the backdrop and thrones have to be set up on the stage, and all the banners of the past 61 Mardi Gras Balls have to be hung from the rafters. Many McNick grads come back specifically to help with the event as well. The last two years, the banners have all been hung by Billy Losekamp Jr. ’11 and Emily Fritz ’11. Mike Atkins ’02, who works as a lighting designer in Wisconsin, began doing the lighting for Mardi Gras as a freshman at McNick, and has continued to come into town every year for the past 16 years to run the lights for the event. Maggie Fehn ’08 has done the sound since she was a student and continues to do it every year. Grads Chris Luerhmann ’10 and Joe Beumer ‘03 also return to assist. There are also multiple media pieces used in the ceremony. Science teacher Regina Goines writes that script that the emcee reads each year. Video Editing teacher Barb Gillming arranges the opening video, and Losekamp makes the PowerPoint presentation that plays throughout the ceremony. Finally, to make sure everything runs smoothly, the members of the court meet three times prior to the dance to rehearse the order of the ceremony. On the night of Mardi Gras, the court members and honor guards report to the library before the ceremony. It is there that the king and queen are first announced. The king and queen then change into their special attire. The king has a tailcoat and gloves, and the queen wears a wedding dress from the collection that McNick has acquired specifically for Mardi Gras. Losekamp said they have around 15 dresses in all different sizes that the queen can chose from, and the committee is always on the hunt for inexpensive dresses to add to the collection. Looking back on his years of involvement with Mardi Gras, Losekamp said that he never ceases to be amazed when everything comes together.